Food Wishes Video Recipes: Can You Smell It? Congrats to you and Michele! I don't think I would want to eat that. It looks like it has white mold on it. 15 dollars for for shavings of something I'd be afraid to step on? Yummmmm, black truffle. Congrats to you and your beautiful wife on your Ninth Anniversary. I hope it was a wonderful meal, and may you have many more of both, special meals and anniversaries! So why did the mushroom go to the party? Because he's a fun guy (fungi). And why did he leave? Because there wasn't much room (mushroom). Remember that song... Aw, me so homely, Aw, me so homely, Aw, me so homely, me luv you long time. Wow. Reminds me of the scene in The Jerk when the waiter brings over the escargot and he freaks out. If some waiter brought that thing in your picture over and told me to smell it... I think I would have gone into Steve Martin mode. Thanks everyone for all the Happy Annv. wishes! Scott, when they brought it over to our table to smell, there was a similar moment to a movie scene...except it was much more like Meg Ryan's cafeteria scene in Sleepless in Seattle! I just watched Andrew Zimmern eat black truffle in Paris on his show. The way he described it, i thought it sounded pretty good, and so did the bacon and eggs ice cream. Its weird though, how much people pay for a moldy fungus found by a pig. Thanks! but I answer all emails (or try) please resend. Give us a hint john, How was it? impossible to do... but it's really about the smell and taste simultaneously hitting your senses. It's the smell of the earth. I don't know if you have seen this free online wild mushroom cookbook, it has a fine chapter about truffles also. "That reminds me, I need to call the plumber." I can even literally taste it! When a certain someone was in Italy last year, they befriended another chef and managed to slip some Albino truffles (at restaurant cost)into their US kitchen and was in heaven for about a week; till they were shaved over a wonderful meal cooked for that certain someones anniversary! Recently something amazing happened (well..to me). 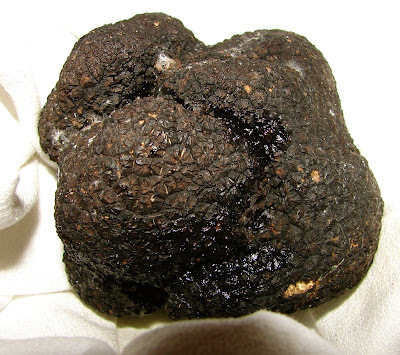 There was a restorant convention in my city where I tried some really delicious stuff on a very low price and while I was walking I saw something that I never thought that I will ever see (or smell)- a black truffle. I was very surprised because where I live there aren't many imported things (we don't even have mac and cheese or pastry dough or baking soda, only baking powder- I've always wondered what the diffrence is). Anyway I was so happy that I decided to buy one. Again I was amazed that it was so cheap - about 3 dollars(2 leva in my country) for a ping-pong sized black truffle ! Sorry for the long comment and thank you for your attention ! Does it smell very strong and earthy? For that price I'm doubting its the real culinary variety of truffle, even at the source that price is very suspicious! Hopefully it is the real deal. Not sure how long they last since I've never had one around more than a few days. The best ways to eat are NOT fancy recipes. Just shave into scrambled eggs, or risotto, or mashed potatoes, etc. the simpler the better. My wife and I will be in SF this summer for our third anniversary. The place sounds so good I just made a reservation for the evening of our anniversary. Any other "can't-miss" places for two foodies to visit in San Francisco or outlying areas? Other favs, Sotto Mare, Hog & Rocks, Universal Cafe, Baretta. Enjoy! Thanks for the great suggestions, really appreciate it! We seemingly have a very similar palate. I would not have palated $15 either (not sure that is a word- but who cares). I wanted to thank you as your videos have rekindled my love for cooking and I have actually lost weight as i am very aware of what goes in my food now. Happy Anniversary. Would love to see a simple Shrimp Salad or Lobster Roll Recipe as Summer starts! !